As ZBrush 3 was recently released, I’ve finally started taking the time needed to fully learn this lovely piece of software. Lot’s of more things for me to explore in this package, but I am getting there. Here is a doodle I made this morning just after I woke up while drinking my morning coffee. 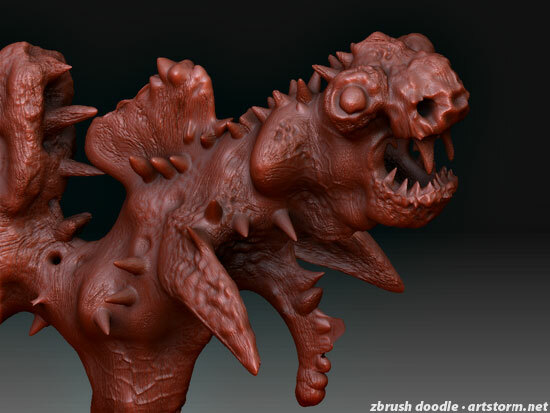 This weekend have been dedicated to ZBrush. This doodling took about 30 minutes from an empty canvas for me to sculpt. I made it entirely inside of ZBrush beginning with the sphere brush and working from there. Just having fun with the sculpting tools. I don’t know what it is really, I was just playing around. It does take some time getting used to this way of working, being used to dragging and pulling vertices for years, and now moving over to this form of almost clay sculpting. But I love it, and I can’t wait to continue digging into ZBrush and making it a major part of my pipeline for my pieces.